This site showcases limited edition letterpress books and broadsides printed by Paul Moxon under the name Fameorshame Press. 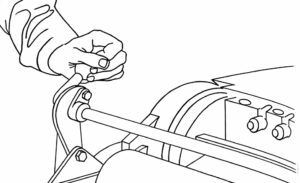 Paul is also an independent educator, author of Vandercook Presses: Maintenance, History and Resources and website editor for the American Printing History Association. The author fears the typesetter, the printer fears the binder, and the designer is afraid of all four. He feels responsible. Yet, in spite of eagle eyes and the greatest circumspection, like the bodyguard of a dictator, he knows that mistakes will happen. He’s been there. So he leaves both fame and shame to the pedestrians who, in naïve self love, line themselves up on the page of particulars and wish to be noticed even before a single line of text has been read. Davies, Hugh William. Devices of the early printers, 1457-1560: their history and development, with a chapter on portrait figures of printers. Dawsons of Pall Mall, 1974. Koch, Rudolph. The Book of Signs. Dover, 1955. McKerrow, Ronald B. Printers’ and publishers’ devices in England and Scotland 1485-1640. Printed for the Bibliographical Society at the Chiswick Press, 1913. 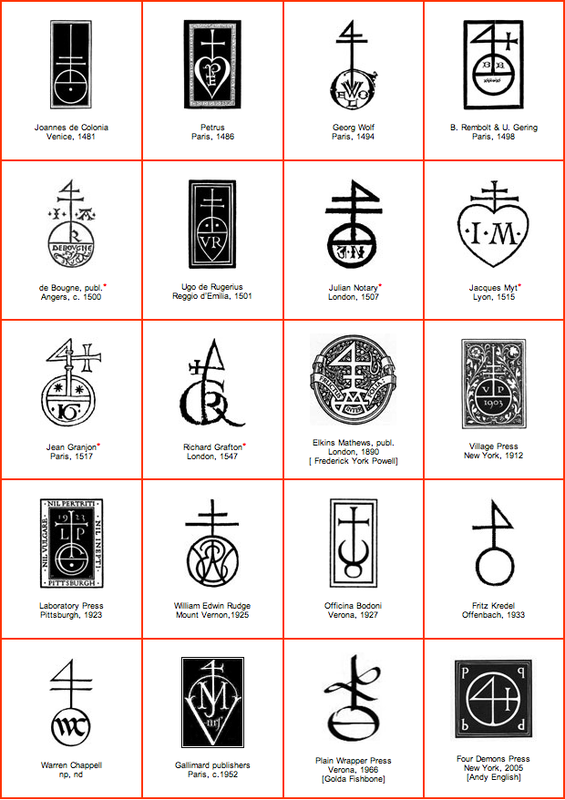 Historically, a printer’s mark is a symbol identifying a particular printer, such a mark was often an element of a larger pictoral image called a device.The marks below are examples of two motifs: the “orb and cross” and the “orb and four”. 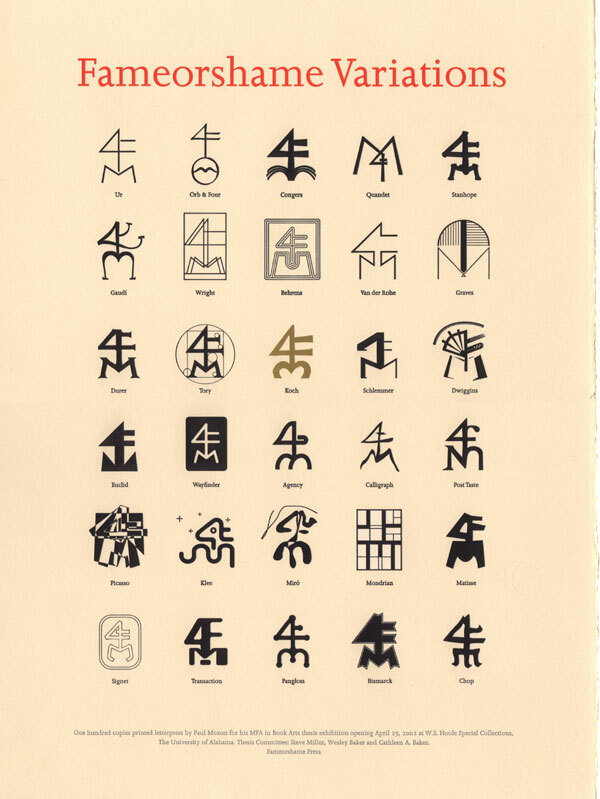 In some instances, in order to clearly represent these marks at sizes useful for comparison it was necessary to delete the florid borders, illustration, and mottos from devices. Where so edited, an asterisk follows the printer’s name. The designer where known is stated in brackets. The informed reader is welcome to note, via email, errors of fact and omission, and to recommend other marks for inclusion. Barr, John. The Officina Bodoni. Books Printed by Giovanni Mardersteig on the Hand Press 1923–1977. The British Library, 1978. Chappell, Warren. A Short History of the Printed Word. Alfred A. Knopf, 1970. Cinamon, Gerald. Rudolph Koch: letterer, type designer, teacher. Oak Knoll, 2000. Davies, Hugh William. Devices of the early printers, 1457–1560: their history and development. Dawsons of Pall Mall, 1974. Goudy, Frederic W. The Alphabet. Mitchell Kennerley, 1922. Library Quarterly, vol 72, no. 1. McMurtrie, Douglas C. The Book: the story of printing & bookmaking. Oxford University Press, 1957. Jeffrey Loop. Four Demons Press. Richard-Gabriel Rummonds. Plain Wrapper Press. Copyright © 2019 Fameorshame.com | Theme by SiteOrigin.